Apart from the sampler that I have been working on for the last 3 or 4 years (sad, I know), this is the first cross stitching project I have tackled in a while. The last issue of CrossStitcher came with a free chart for a Keep Calm And Cross Stitch design. It was a birthday present for Marco's aunt, who is the best quilt maker! I hope she really likes it! I chose a piece of vintage fabric as a background and used waste canvas to help with the count. The floss is Anchor thread No. 1098 in a bright orangey red. Because of the waste canvas, the stitching was not as neat as I would hope for. 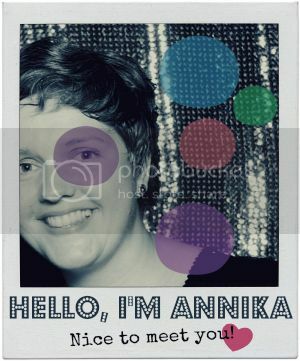 This is really sweet Annika! She must be very happy with her present! I love handmade gifts! I hope you had a good weekend! I've been feeling a bit burnt out these days with all my to do lists, so I made sure I had nothing planned in my brain yesterday. Just thinking about things to do has made my brain a little fried, especially in this hot weather here. Hi Annika! Thanks for visiting my little blog! I love this project -- it's really sweet! I remember my mom using waste canvas for cross-stitch projects when I was small, but I haven't yet played around with it myself. Now you've got me thinking that it's time to give it a try. Cheers! What an awesome piece! I'm sure she'll love it, you did a fantasticcc job! It looks great on the vintage fabric. My mum used to cross-stitch a lot and always tried to get us involved when we were younger. Funnily enough it's one of the few crafts that I have never really done much of - I always thought it was a little old-fashioned, but this makes it look really contempoary and fun. That's so pretty! I love it that you did it on a floral fabric. ah too gorgeous! I wish I had more time as I have a long standing love for cross stitch.